The other night I had salmon for dinner but my pleasure in eating it was destroyed by knowing that it is farmed in Tasmania where salmon farming is so intensive it is badly polluting the local environment and that salmon raised in crowded conditions suffer stress as do all animals forced to live in such an unnatural manner. I felt turned off by the current media about how the salmon we buy is artificially coloured pink as the fish do not eat the normal diet they would have in the wild to give them their colour but instead are expected to form their flesh from dried up wastage from the chicken industry! How can I enjoy salmon again unless I know it was caught in the wild rather than corralled and extracted from a paddock in the sea. Where do I find wild salmon? Is there enough to go around and do I need to set aside a day’s pay for one serve? The next day for lunch I opted for an omelette made from free range eggs. But my conscience was not clear. I know the eggs labelled as such are not necessarily genuine free range. Even if they are “ free range”, I know is not free in the sense that the birds have an enjoyable life scratching around and eating a varied diet straight from the earth as do the happy hens on a friend’s tiny farmlet in a town an hour or so from Melbourne. Instead, hens producing “free range” eggs for the masses have a couple of hours per day outside and otherwise they are crowded into barns. So I could not feel 100% happy about my omelette. What about vegetables? Well apart from the fact that the growing of vegetables for humans displaces nature on the land required I suppose I can consume with reasonable impunity. I could grow them myself but on the tiny amount of land I own and the small amount of sunshine available after the house next door and its tall hedge have stolen most of it except in summer, my supply would be extremely erratic. No, I cannot rely on that except the occasional garnish of parsley..
Aside from vegetables a vegetarian diet may include biscuits, bread and pastry all of which can transform a vegetable selection into a satisfying meal. But hold on a moment! I see from the packet that the biscuits I am about to eat contain palm oil the production of which has driven land clearing in the places it grows best. This land clearing has destroyed the habitat of one of our close relatives, the orangutan and as species , they are in peril! I can’t eat those biscuits. I’ll opt for those not containing palm oil. But all biscuits are made from grains. The production of grains for an ever growing population of humans drives land clearing and habitat loss! This is undeniable! All land taken over for agriculture must be taken from other species, be they orangutans, elephants , kangaroos, all kinds of birds reptiles, insects (including bees). I can avoid palm oil but can I avoid grains if I am a vegetarian? The other large category (before I get onto meat!) that is morally problematic is “dairy”. Milk, yoghurt, cheese, cream, butter all of which I love. But they are produced by animals (usually cows) that are forced to calve annually, to be separated from their babies before those babies even have the brief pleasure of suckling from their mothers. The babies (“poddy” calves) are hand fed up to the day they go market . Forlorn and abandoned they await their fate to become another delicacy that I decided long ago not indulge in – veal. I cannot eat any dairy products without thinking of the poor exploited animals who provide it to me. What about meat from land based animals? Firstly let’s take chicken. I love it! I also love chickens. They are delightful creatures. The chickens bred for meat now look nothing like the chickens we may have known personally as children. I knew them from my grandparents' place where they happily scratched round all day after producing an egg each in the nests in their coop. My grandmother would select one to eat maybe 3 times per year so they had a dual role! Meat chickens now are lethargic and inelegant sedentary creatures displaying little curiosity. Such a creature can garner a lot of flesh on its bones quite quickly unlike the active, exploring, scratching sort of chicken we think of when we think of a chicken. I find that off-putting. For me it is a step too far into genetically engineered dinner. The first favorite food in my life was bacon. I loved it, especially the way my mother cooked it – crisp, hot and a few ribbons of fat bordering the very tasty lean meat. I still love bacon but I have hardly eaten it at all for 20 years because of what I know about the conditions that pigs live in before they are harvested for us. It makes me very sad to see a sow’s body pressed up against a metal frame supposedly for her own good and pigs living in concrete enclosures. I would feel happy eating bacon if I knew the pig had run around and wallowed in mud during its life. Beef- well maybe the cattle involved get the best deal. I know people who produce beef and I know they care about their animals. Perhaps their lives are acceptable til it is time to meet their maker. I would be happy to eat a porterhouse steak if I knew that the animal’s life had allowed him to express his nature, that he had felt the sun on his back and enjoyed the shade of a gum tree whilst looking at the sunset and later met a swift, unconscious end, knowing nothing about it. But when I see the way our beef cattle from the north are treated overseas, it puts me off beef full stop. I stop trusting anything about its production. Where does this leave me ? Sushi has lost its shine, Orange Roughy is a no- no ; its life cycle is too long for a regular harvest to be sustainable. What about tuna? Well it might be Ok except that it is caught with large nets that take in other marine animals. There are also some doubts about the sustainability of this "resource", anyway. Where do I go from here? There are problems with everything as I try to compose my menu. The problem is that everything needs to be produced on such a large scale to fulfil the needs to humans who have spread all over the globe and increased their population from 1 billion around 1800, to now over 7 billion and rising! About 2 billion people globally are hungry or undernourished. Many in first world countries are malnourished on a diet of addictive junk foods such as fries and hamburgers and these same people may well be obese from the excessive but empty calories of their diet. As for me, I just suffer from “moral starvation”. This is not an inability to access food, but an inability to find anything I can eat with a clear conscience that is not part of a harmful industry. I suppose I could hunt for and gather my own food but there is little game or produce in the suburbs. An excellent article. I wish more people thought about the origin of their food. A few comments. First of all it's impossible to live without killing anything. Even if you were a breathairian and a Jain you would still be breathing in microbes and killing them. But then again everything is relative. There is less suffering eating a plant-based diet than an animal-based diet because all those animals have eaten so many vegetables in their lives so it's not 1:1. And this is not even addressing the question of 'Do animals have more consciousness or feel more pain than a plant?' a question fraught with moral challenges. While this diet is not totally cruelty free, it is relatively cruelty free - and you can enjoy food again with a pretty clear conscience. And more - you will live longer and avoid degenerative disease (see 'How Not to Die' by Michael Greger M.D.). Another great book to read on this subject is 'The World Peace Diet' by Will Tuttle. The ethics of veganism are misguided and my reason as to why makes it clear that it doesn't matter whether or not people eat meat - it's how many people are eating full stop. I don't believe veganism is a viable conservation and environmental strategy because the problem with ethical veganism, the thing that makes ethical veganism an illusion, is this - vegans believe that they are refraining from causing any cruelty or suffering to animals or harm to the environment by avoiding the consumption of animal products, when what is really doing damage to the planet is human overpopulation and agriculture. Countless species of wild animals are being displaced, injured and killed, and natural environments destroyed, in order for the plant crops (grains, vegetables, fruits, legumes) vegans depend upon to be cultivated. (It has recently been publicly considered in anti-overpopulation circles that the production of soy/tofu may be more environmentally destructive than that of meat production, although raising cattle for beef is certainly an environmental disaster!) Make no mistake, no matter what diet you follow, living creatures are dying so that you may live, whether you are vegan or not. There is no such thing as cruelty-free food, which makes moral arguments for veganism somewhat illogical. A substantial reduction in the human population is the only thing that will improve the lives of all animals in any meaningful way. As long as there are too many people, the problem isn't what they are eating - it's that they are eating! Anybody who doesn't have access to buying fresh, clean and green vegies may wish to visit any of the following 4 markets where vegies grown biodynamically can be purchased: Veg Out - Chaucer St., St.Kilda, Collingwood Children's Farm - St.Helliers St., Abbotsford, Gasworks Arts Park - Graham St., Albert Park or Convent Slow Food also in St.Helliers St., Abbotsford. If this isn't convenient readers can go to: http://saveoursoil.com.au/ Mark and Kathy Rathbone have a good range of vegetables that can be bought on-line. Unfortunately, due to the very wet winter sales have been suspended until January. The production of beef and other animal protein consumes huge amounts of natural resources such as water, fossil fuels and topsoil, while polluting our water and air. In fact, switching to a plant-based diet from a meat-eating diet is the single most important move we can make to help the environment. The production of corn and soybeans, the major grains fed to livestock, causes massive soil erosion because those crops are grown in rows. From our rainforests to our oceans, natural habitats and the plants and animals that live there are disappearing at an alarming rate. If our population increases by two billion in the next 35 years, we’re going to need to give some serious thought as to how we can feed the world. The other ethical aspect is the one of animals used in mass production, in factory farming. It's the animal-equivalent to the Industrial revolution, in which workers were no more the cogs in a big machine, for production. Short, confined lives in sheds, with animals being mutilated so they are not "aggressive" due to the crowding. It's animals as products, not sentient creates. Monocultures means the loss of genetic diversity, relying on antibiotics to avoid disease. What is humane about any slaughter? Somehow it's assumed that food is ethically neutral, just packets in supermarkets. What we eat has a huge impact on our planet, society, animals and it's our closest link to Nature. The violence we perpetrate to eat no doubt has massive implications to the disruption of conflicts happening on our planet today. Land clearing, loss of biodiversity, monocultures, and destruction of Nature for our food is not sustainable. 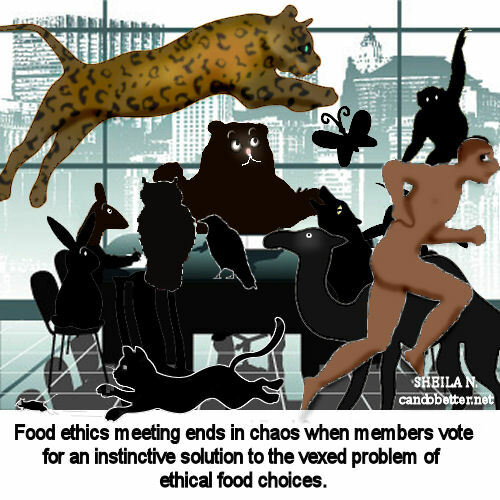 Eating down the food chain is the most environmentally sustainable, and ethical.